All the power of green tea - naturally! Studies conducted on green tea over the last few years have provided mounting evidence of the health benefits of its polyphenols, such as potent antioxidant, anti-bacterial and anti-cariogenic effects. They protect the kidneys and have thermogenic properties thus promoting effective weight control; they help in regulating blood sugar and lipid levels, and above all, seem to play a very important role in longevity. ¤ Although there are over 3,000 types of tea, they all originate from the same plant species, Camellia sinensis. Unlike fermented teas (such as oolong and black tea), green tea undergoes rapid steam-drying. This inactivates enzymes and allows its natural ‘chlorophyll’ colour to be retained, as well as its polyphenol content, largely made up of catechins which represent 20% of the leaf and which are responsible for the majority of green tea’s health benefits. 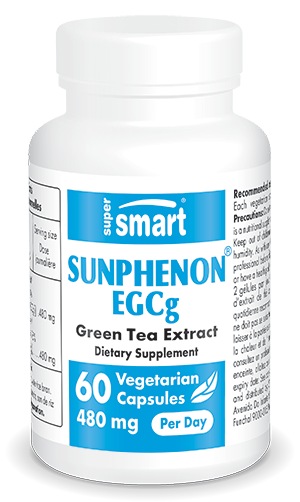 ¤ Sunphenon® is a new green tea extract with a very high catechin content, particularly epigallocatechin-gallate (EGCg), which significantly increases its efficacy and explains its multiple benefits for maintaining optimal health. Sunphenon® has significant antioxidant capacity because of its high content in the most powerful of the catechins, EGCg - it is 20 times more potent than vitamin E. EGCg neutralises reactive oxygen species and free radicals and as it is easily crosses the blood-brain barrier, it helps protect the brain from oxidative stress. ¤ This ability to neutralise age-related free radicals makes Sunphenon® a key anti-ageing supplement for ensuring antioxidant protection. ¤ Taking a green tea extract standardised in EGCg produces a faster increase in antioxidant levels in the blood than drinking green tea, and has none of the side-effects of theine. Its most important characteristic, however, was highlighted recently in a series of studies conducted at the Charite University of Berlin. This cell-experimental and animal research showed that EGCg has a neuro-protective effect over and above its antioxidant effects, related to the expression of genes regulating cell survival or programmed cell death (apoptosis) as well as modulation of mitochondrial function. ¤ It seems EGCg causes an induction of alpha-secretase as well as other enzymatic mechanisms, and prevents the aggregation of beta-amyloid to toxic oligomers. ¤ Study author Dr Paul Friedemann and his fellow researchers thus consider EGCg to be a promising substance in the prevention of Alzheimer’s disease and its development. ¤ Green tea extracts standardised in polyphenols, particularly EGCg, are now also recognised for their ability to lengthen telomeres. According to a large-scale Chinese study conducted by the University of Hong Kong involving over 2000 participants aged 65 or over, consuming at least 700ml of green tea a day was associated with an average increase in telomere length of over 46%, corresponding to a five-year extension in lifespan, particularly in men. ¤ Today, green tea polyphenols are increasingly recognised and recommended for fighting fat and achieving controlled, safe weight loss as a result both of their ability to regulate genes, and the antioxidant properties of EGCg. ¤ Its role in improving the control of lipid metabolism and reducing lipoprotein oxidation makes Sunphenon® an excellent protector of the cardiovascular system. It also supports optimal circulatory function by inhibiting the angiotensin-converting enzyme which is partly responsible for high blood pressure. ¤ Green tea polyphenols are recognised for relieving digestive problems and increasing intestinal peristaltism. Sunphenon® has thus been shown to be particularly beneficial for those with a tendency towards constipation. ¤ Green tea is becoming increasingly popular as scientific evidence continues to confirm its health benefits. However, doubts have been raised over the quality and safety of green tea extracts because of the questionable extraction methods used by some laboratories and a general lack of regard for regulations governing authorised solvents and pesticides. Sunphenon® is guaranteed to be non-toxic. It is obtained from green tea leaves that have not been treated with prohibited pesticides and it is extracted via a simple water infusion process. It is decaffeinated using food grade solvents, without the use of chloroform or other non-regulation-compliant solvents. It is also guaranteed to be free from heavy metal residues (mercury or lead). Each vegetarian capsule contains 240 mg extract of green tea.